Colonel Chris Hadfield will speak in Kelowna on October 7 as part of UBC’s Distinguished Speaker Series, presented by the Irving K. Barber School of Arts and Sciences. “Good morning, Earth.” That is how Colonel Chris Hadfield – writing on Twitter – woke up the world every day while living aboard the International Space Station (ISS) for more than five months. And fans did not need imagine the view from space 423 km above Earth’s surface – Hadfield tweeted magnificent photos of our lush green homeworld to his nearly 1-million followers. Since blasting off from Kazakhstan in December 2012, Hadfield has become a worldwide sensation, harnessing the power of social media to make outer space accessible to millions and infusing a sense of wonder into the collective consciousness not felt since man first walked on the moon. 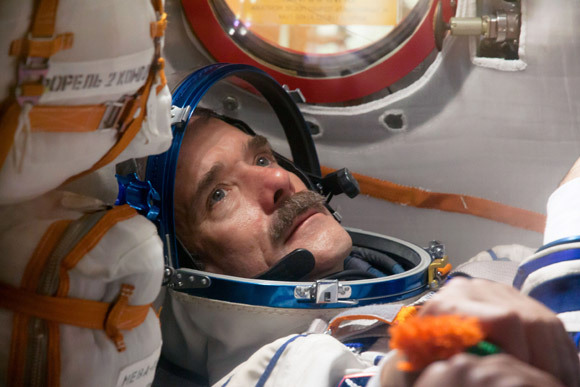 Called “the most famous astronaut since Neil Armstrong” by the BBC, Hadfield continues to bring the glory of science and space travel to everyone he encounters. Hadfield will speak at Kelowna’s Community Theatre on Monday, October 7, as part of UBC's Distinguished Speaker Series, presented by the Irving K. Barber School of Arts and Sciences. In this passionate and illuminating talk, Hadfield imparts the useful and practical lessons he’s learned throughout his remarkable career in the fields of leadership, teamwork, collaboration, science and technology, and motivates audiences to achieve dreams higher than the clouds. Early registration has made this a full-house event. Registration is now closed and there are no tickets remaining. There will be a wait list at the Kelowna Community Theatre, 1375 Water St., Kelowna, the evening of October 7 and any unclaimed tickets will then be available.